Music is an art that requires time in which to exist. It’s not enough for music notation to tell us which notes to play, but it must also indicate when to play them and for how long. Pitch is determined by notehead placement and accidentals while rhythm is determined by filled and unfilled noteheads, stems coming out of the noteheads, and flags (or beams) coming out of the stems. Pitch – the frequency at which a sound vibrates. Staff – five horizontal parallel lines on which music is written. Clef – a symbol appearing at the beginning (left) of the staff that determines which lines and spaces determine which pitches. Treble Clef (G clef) – a clef indicating that the G above middle C is on the second line up. Bass Clef (F clef) – a clef indicating that the F below middle C is the second line down. Grand Staff – a set of two staffs that uses bass clef on the bottom staff and treble clef on the top. Notehead – a dot on a staff that indicates a specific note. Ledger Line – The line on which a note sits when the desired pitch is above or below the staff. When you hear various pitches, you hear them as higher or lower respective to each other. This is because the pitches are vibrating at different frequencies. The higher the frequency the higher the pitch, and the lower the the frequency the lower the pitch. In music, we organize these pitches into twelve pitch classes. A pitch class is a set of frequencies that are related to one another in a 2:1 ratio. This is not as complicated at it seems. Take C for example. A middle C vibrates at a certain frequency (about 262hz if you’re curious). Go to the C above that, and it will vibrate twice as fast. Likewise, if you go to the C below middle C, it will vibrate at half the rate. Since this pattern will continue throughout every C, all of the C’s that are possible are then related to one another in a 2:1 ratio. As you might guess, all of the C’s sound the same except that they are higher or lower than one another. For this reason, every C that you will ever hear belongs to the pitch class we call “C”. You may have noticed by now that there are only seven pitch classes in example 1-1 (A, B, C, D, E, F, and G). Don’t worry about that yet, just know that there are twelve. Naming an individual pitch must be done more specifically than simply naming a pitch class. Each pitch has a name, and if you want a certain pitch within a pitch class, you have to give the full name of the pitch. Notice that in example 1-1 I have not only labeled every C, but I have also given each C a number. Middle C is also known as C4 (not to be confused with the explosive). The next C above C4 is C5. The next C below C4 is C3. Now when I say “C6,” you know that I am talking about a specific C that is notated by putting a dot on the second ledger line above the treble staff. Had I just said “C,” you would have had several options from which to pick. For some reason, the numbers change at C. I don’t know why they picked C. It’s just the way it is. The B below C4 is B3 and the D above C4 is D4. Every time you come to a C while moving up, the number goes up. Now you know that if I say “A2” that I am talking about the A in the bottom space of the bass staff. If you’re confused, just keep reading. If this doesn’t make sense soon, give it another try tomorrow. Interval – the distance between two pitches. Step – an interval going from a space to a line next to it, or going from a line to a space next to it (on a staff). Half-step – the smallest possible interval in traditional western music. Whole-step – two half steps. Accidentals – symbols indicating that the pitch should be a half-step or a whole-step higher or lower than the notehead by itself would indicate. Flat – an accidental indicating that the pitch is a half-step lower than what the notehead indicates. Sharp – an accidental indicating that the pitch is a half-step higher than what the notehead indicates. Natural – an accidental indicating that the pitch is exactly what the notehead indicates without any alterations. Double Flat – an accidental indicating that the pitch is a whole-step lower than what the notehead indicates. Double Sharp – an accidental indicating that the pitch is a whole-step higher than what the notehead indicates. All of these symbols are called accidentals and they all modify or emphasize what the notehead by itself originally indicated. Take the flat in example 1-2: without the accidental that note is simply a B. With the flat in front of it the note is now a half-step lower and should now be called B-flat. It is too high to be an A and too low to be a B. It is somewhere in between the two. Likewise, the next note in example 1-2 used to be an F, but with the sharp in front it becomes F-sharp. It is too high to be an F, and too low to be a G.
Naturals indicate that the note is what it says it is. In chapter two we will begin discussing rules that cause notes to be raised or lowered without an accidental in front of it. The natural cancels such rules. Double flats and double sharps seem to be useless at this point, but they exist simply for the purpose of making more complicated compositions easier to read. You will encounter them, and with time you will discover why they are useful. For now, simply make sure you know what they do. A double flat lowers a note by a whole step. 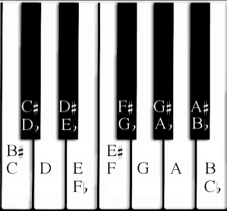 In example 1-2, the A-double flat is literally another way of saying that the note is a G since G is a whole-step below A. Likewise, the C-double sharp indicates a D since a D is a whole step above C.
These different names for the same pitches are called enharmonic spellings. An enharmonic spelling is an alternate way of indicating a given pitch. For example, the A-double flat in example 1-2 is an enharmonic spelling of G. The C-double sharp is an enharmonic spelling of D. This also applies to the pitch classes we’re working on discovering right now (we just learned B-flat and F-sharp). Another way of writing the B-flat is to write an A-sharp. In the same way, G-flat is an enharmonic spelling of F-sharp. If there is a pitch in between a whole-step, you can write it in at least two different ways. As you can see, not every natural step is a whole-step. There are no pitch classes between C and B or E and F. A half-step above B is C and a half-step below F is E. Therefore, we have to be careful when thinking about enharmonic spellings. An alternate spelling for C-flat, is not B-sharp. Rather an alternate spelling for C-flat is B-natural. Again, this is because a flat lowers the original note by a half-step. When you lower an F by a half step, it is an E (or F-flat). Whether or not you’re feeling comfortable with everything you just read in this chapter, my suggestion is for you to pick up some music and start trying to read/play/sing the notes. If you’re a singer, the piano is your most important tool. Find one, use the diagram on the right, and start plunking out the notes to help you sing the correct pitches. If you’re an instrumentalist, play the notes on your instrument. If you don’t know how to find the notes on your instrument, do a little research on the internet and figure out how. Don’t worry about doing it perfectly, just get your head in some music and try to apply however little or much you just learned. The best way to not make any progress in your ability to read music is to not try. A Spanish textbook teaches you how to read Spanish, but if you don’t try to read Spanish outside of the textbook you will not learn to read. It is the same here.